Wiping your bass down after use to remove rosin from its top will keep it looking good. Regardless of the level of importance you place on the appearance of your instrument, normal maintenance should include regular cleaning and polishing. In this tutorial I will address general cleaning maintenance, including some guidance on when to hand your bass over for French polishing. Cleaning a bass can feel like fighting a losing battle at times. However, if you are diligent and wipe your instrument down after use to remove rosin from its top, you can keep your bass looking good with the minimum amount of commitment. Fine violin polishes made expressly for use on stringed instruments are my recommendation. Never use commercial furniture polishes on your bass: they usually contain carnauba-type wax and often silicon, both of which are totally incompatible with good quality violin varnish and in the long run will have a negative cosmetic effect on it. In some instances very serious damage can occur to the original varnish, requiring major cosmetic restoration and possible depreciation in the value of the instrument. A good polish for use on a bass should be basically composed of essential oils without any form of wax or silicon in the formula. Once applied, a suitable polish will not only restore the original quality of a fine varnish, in most cases it will also inhibit rosin from sticking to the finish. Negligence can be another culprit in poor maintenance. 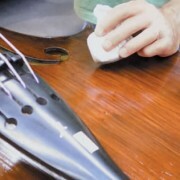 For example, when rosin is allowed to build up on the instrument and is left untended for a long period of time, it often becomes embedded within the varnish. Rosin and varnish are of a similar composition, based on natural tree resins, and if rosin sits on the varnish for too long it can eventually become bonded to it. In extreme cases even the best of instrument cleaners will not be able to remove the bonded rosin from the surface. This damage then has to be treated with a ‘wet paper’ method, whereby an extremely fine-grit wet/dry sandpaper is used to physically remove the embedded rosin. In the hands of an expert, this method is quite successful, but it does result in a dulling of the varnish finish, which will then require a full French polish to restore its original patina or fine look. French polishing, also known as pad varnishing or pad polishing, is a technique used for centuries by fine makers and restorers of furniture – and luthiers. It uses a spirit or turpenial based formula which is applied to the bass with a cotton wadded pad to soften the upper layer of the varnish. I must emphasise that this process should only be attempted by an experienced restorer. It is a most treacherous method of polishing that can either result in an instrument’s finish or patina being restored to high quality, or turn into a nightmare for the owner and the instrument. Prior to French polishing, any severe rosin build-up on the bass must be removed by using the high-grit wet/dry sandpaper method mentioned above. This leaves the finish in an excellent preparatory state. However, the French polishing process is fraught with risks – not only should it be done only by a competent repair person, but the use of alcohol or caustic solvents like xylene, toluene and others can be detrimental to your health. Using solvent is also a bit like playing Russian Roulette – there’s a potential accident waiting to happen to you or the bass. And remember that French polishing should be done periodically to enhance the patina of an instrument, but not with any frequency. If a bass is French polished once a year, this is more often than average. A good musical instrument polish will maintain varnish at a fraction of the cost. The question often arises as to whether cosmetic maintenance really has a bearing on the playing qualities of an instrument. Initially, most would argue that the condition of the varnish is superficial and more aesthetic than anything else. I too would generally lean towards this way of thinking. However, in my long time as a restorer I have come across some basses that have been so grossly neglected that the rosin buildup on the top of the instrument, as well as the bridge of the bass, is so heavy that it actually restricts these parts of the instrument from vibrating properly. This may sound extreme, but I have been involved in correcting this situation more often than I would wish. These cases of neglect take a good deal of time to correct, and to bring the varnish back to the original or close to original condition is difficult. It also usually results in a hefty restoration charge and a lecture to the negligent owner. If you wish to optimise the tone of your instrument and maintain its structural integrity, then bass maintenance is your own responsibility. An instrument that is not properly maintained, whether from neglect or poor repair workmanship, will eventually be a candidate for extensive restoration with the inevitable associated costs. Like most things in life, preventative maintenance, either by yourself, if appropriate, or by a qualified repair person, is the most effective and efficient direction.